Jennifer Estep. Midnight Frost. New York: Kensington Publishing, 2013. Gwen Frost can’t stop having nightmares. They’re eerily realistic and they all end the same way, with dreamy Logan Quinn, Gwen’s (almost) boyfriend, stabbing her in the chest. Since Jennifer Estep’s last Mythos Academy installment, Logan and Gwen’s developing relationship has been brought to a screeching halt following Gwen’s arrest and trial for the crime of releasing Loki from his imprisonment. Now Gwen has no idea about Logan’s whereabouts. And his absence is weighing heavily on her, along with the increased attention from the rest of the student body. Students don’t just point and stare – they’ve created a phone app to track Gwen’s every move. She might be Nike’s Champion, selected by the Goddess herself, yet Gwen has her doubts. She isn’t strong or fast like the other students of Mythos Academy who have warrior lineages. Students descend from Vikings or Amazons, or even Spartans. Gwen is just a Gypsy, albeit a Gypsy with the mysterious skill of psychometry, a magical trait that allows her to learn about people or objects simply through touching them. And the Reapers want her dead. During a botched attempt to poison Gwen in the Library of Antiquities, librarian Nickamedes is poisoned instead. Professor Metis works what magic she can to keep Nickamedes alive, but it’s up to Gwen and her friends to seek the antidote to the deadly Serket sap. Their trek leads them to the Denver branch of the Mythos Academy. A rare flower, Chloris ambrosia, grows in the Eir Ruins near the school and contains the antidote to cure Nickamedes’ poisoning. Despite an early threat en route to Denver, the journey feels easy, a little too easy. Sure the Reapers want to kill Gwen. But why are they luring her all the way to Denver? 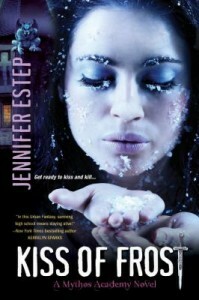 Midnight Frost is the fifth book in novelist Jennifer Estep’s Mythos Academy series. In this volume, readers will discover a few more details about Gwen’s father, Tyr Forseti, plus some unsavory information about her paternal relatives. There is a map of the school’s Library of Antiquities in the front of the book and a few brief indices at the back of the book on the Warriors and the Magic, the Mythos Academy, the Students, the Adults, and the Gods and the Monsters to get readers entrenched in Gwen’s world. Estep keeps her characters relatable. She merges the supernatural with the everyday; characters possess extraordinary powers yet exhibit normal teenaged impulses too. Estep also blends many strands of mythology. What other book could readers pick up that combines elements of Norse, Egyptian and Greek mythology, and feature a cheeky talking sword? If you’re new to this series, start by reading our first entry on Estep’s Mythos Academy. Or, check this title’s availability in the UNC-Chapel Hill Library catalog. Jennifer Estep. Crimson Frost. New York: Kensington Publishing, 2013. With the Norse chaos god Loki freed from his prison, Gwen Frost should be extra careful. 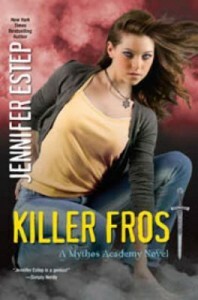 Besides an evil god, she also has to look out for his Champion, a murderous girl called Vivian, and her army of Reapers. Life at the Mythos Academy, high in the supposedly peaceful mountains just outside of Asheville, has never been more dangerous. And yet, Gwen has never been so happy. Logan Quinn, the boy she’s had a crush on forever, has finally asked her out. He’s even given her a winter present– a beautiful snowflake necklace. They’re sitting together in a local coffee shop when Gwen’s reality finally comes crashing down around her. She’s arrested by the Protectorate, her world’s governing body, for the crime of…freeing Loki from imprisonment. It all seems like some ridiculous joke. Gwen almost died in the attempt to keep Loki from being unleashed on the world, and now she’s being accused of helping him to escape? The Protectorate is very serious, however, in its accusation. Soon the entirety of Mythos Academy knows that Gwen is an evil Reaper, and they all want revenge. This would be uncomfortable in a normal high school, but at Mythos Academy, a training school for the descendants of ancient warriors, it’s definitely deadly. Will Gwen be able to survive not only Loki and his Champion, but the anger of her fellow students? Will she ever clear her name? And will Logan stand by her during her trial, even when his father is the head of the Protectorate? Young adult readers ages 13 and up will enjoy the continuing adventures of Gwen and her friends in this fourth installment in the Mythos Academy Novels. 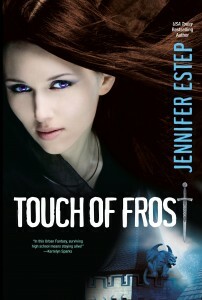 Jennifer Estep. Dark Frost. New York: Kensington, 2012. Gwen Frost is supposed to be a normal high school student, or at least as normal as any of the superhero-like kids she attends the Mythos Academy with can be. Unbeknownst to the residents of Asheville, the elite private boarding school nearby isn’t filled with rich kids, but with the descendants of mythological warriors. Unfortunately, the Greek goddess Nike has chosen Gwen to be her champion. This means that the evil Reapers, servants of the Norse chaos god Loki, want her dead. Or at least she thinks that’s why. Gwen’s mother was also Nike’s champion, until she was killed in a car crash two years ago. As Gwen soon discovers, the car crash was no accident, and her mother was guarding a dagger of terrible power that the Reapers want more than anything. Convinced that Gwen knows its whereabouts, Loki’s mysterious and wicked champion plays a deadly game of cat and mouse, trying to trick her into revealing its hiding place. Gwen knows nothing, other than that she must find the dagger before the Reapers. But with her best friend Daphne in crisis, a pregnant Fenrir wolf on her hands, and confused teenage love on her mind, it’s hard to focus. Will Gwen be able to overcome her personal demons in time to face the very real demons? Young adult readers ages 13 and up will enjoy this third book in the Mythos Academy Novels. 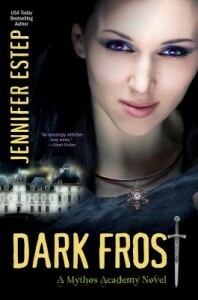 Jennifer Estep. Kiss of Frost. New York: Kensington Publishing Corp., 2011. High school is a hard time for a lot of kids, and Gwen is no different. The popular girls tease and snub her, and the handsome boy she has a crush on is dating an Amazon. Literally– Savannah is an Amazon, a direct descendant of those powerful ancient warriors, just as her boyfriend (and Gwen’s crush) Logan Quinn is a Spartan. At the Mythos Academy high in the mountains above Asheville, ancient mythology is still alive and well in the several hundred young men and women who attend school there. At Mythos, they learn fighting skills and the history of their illustrious ancestors. After, many go on to become the heroes that defeat the very real monsters living on into the modern age. Gwen isn’t a hero, or at least she doesn’t think she is. As a Gypsy, Gwen has the power of psychometry: she can read others’ memories and emotions simply by touching them or their belongings. Logan and his warrior buddies are trying to teach her how to fight, but it’s not working very well. Then the whole school heads off to a resort in the Smoky Mountains for Winter Carnival, a yearly holiday where students ski, drink hot chocolate, and like typical high school students, go to wild parties. Gwen doesn’t want to go– she’d rather stay at Mythos and read in her room. But Daphne, Gwen’s best friend, refuses to let her stay behind. Soon, they’re all on a bus to the fancy resort, and Gwen should be excited…except something sinister is going on. Last year, a Reaper, one of the chief enemies of heroes like the Mythos Academy students, tried to kill Gwen and failed. Maybe it’s paranoia, but Gwen is getting the distinct feeling that it’s happening all over again. Will her winter holiday end in disaster, or even death? Will Logan Quinn ever notice her? And, worst of all, will Daphne drag her to all the late-night parties? Young adult readers ages 13 and up will enjoy this second installment in the Mythos Academy Novels. 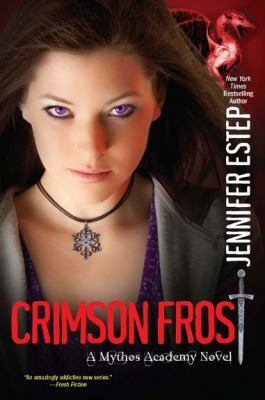 Jennifer Estep. Touch of Frost. New York: Kensington Publishing Corp., 2011. Gwendolyn Frost doesn’t think she’s anything particularly special. Sure, she’s a Gypsy: like all the women in her family, she has a special gift related to knowing secrets. Her grandmother can see the future, her mother could tell if someone was lying or not, and Gwendolyn can learn things about a person by just touching them or objects belonging to them. But Gwen doesn’t think this gift adds up to much, at least not compared to her classmates. Because Gwen attends the prestigious Mythos Academy, high in the mountains north of Asheville, North Carolina, and her classmates are all descendants of warriors or mythical beings: Spartans, Romans, Valkyries, Amazons…the list goes on and on. The only thing they can’t do, it seems, is befriend an awkward Gypsy girl. The only one who seems to pay any attention is Logan Quinn, the most gorgeous, and the baddest, guy in school. Gwen isn’t sure what she’s done to earn his scrutiny, but she’s more frightened than flattered.